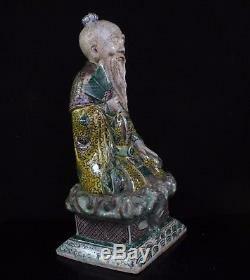 Chinese Kangxi Biscuit Glazed Famille Verte Seated Dignitary Figure. 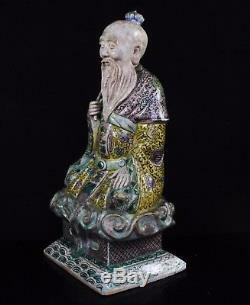 This is a very fine quality biscuit glazed, famille verte figure of a seated dignitary, 19th century or earlier. CONDITION losses to the top of the fan, chips to the top of the topknot on the head, minor chips to the rim of the base - as per images. The overall condition is as you would expect from an object of substantial age that has been displayed/handled/used, usually over the lifetimes of several owners. Items are packed defensively & extreme care is taken to ensure you receive goods in perfect condition. 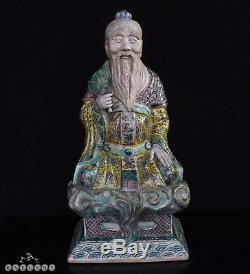 The item "Chinese Kangxi Biscuit Glazed Famille Verte Seated Dignitary Figure" is in sale since Monday, January 08, 2018. 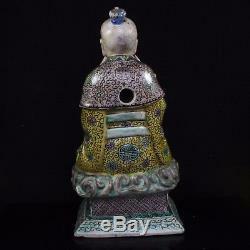 This item is in the category "Antiques\Asian/Oriental Antiques\Chinese\Figurines & Statues". 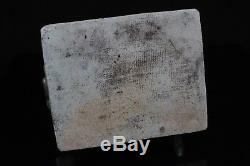 The seller is "ratgallery" and is located in Southbourne. This item can be shipped to North, South, or Latin America, all countries in Europe, all countries in continental Asia, Australia.